Started as a tongue-in-cheek comic by Alison Bechdel, the Bechdel Test asks if a movie (a) has two named women who (b) talk to each other (c) about something other than a man. While the Bechdel Test can’t really speak to the quality of an individual film, it works really well as a metric for analyzing larger trends of female representation in film. And a new website called Women In Film may prove the definitive tool for applying the Bechdel Test to the films of the past five years. Although it might take a moment to figure out the interface, the interactive site contains data for over 1,500 movies released between 2010-2014, which users can easily customize. For instance, on this page users can select a film genre to see a list of the films that pass and/or fail each step of the Bechdel Test. So it’s easy to find out that over the past five years, 23 historical films have passed all three steps of the test while 22 comedies have failed all three. It’s even possible to get more specific and learn that there are nine family films that have two named women but don’t show any scenes of those women talking to each other. Elsewhere, this chart visualizes the overall pass/fail ratio and can be customized for 22 genres over each of the past five years. Broken down like this, it’s easy to compare trends in female representation by year. For instance, while on the whole 37 percent of the films surveyed over the past five years failed the test, in 2014 in particular 45 percent failed, making it far and away the worst year of the past five. 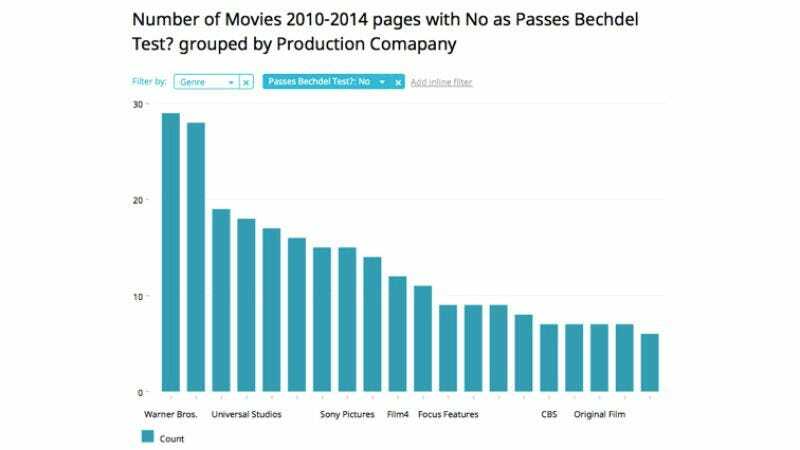 There’s also a graph that examines what percentage of films have passed the test since 1892, as well as filters to search by director, studio, award wins, and a whole lot more. The site is a bit overwhelming at first glance, but will likely prove an invaluable resource for those looking for concrete data on female representation and/or those who want to brush up on their graph analysis skills.